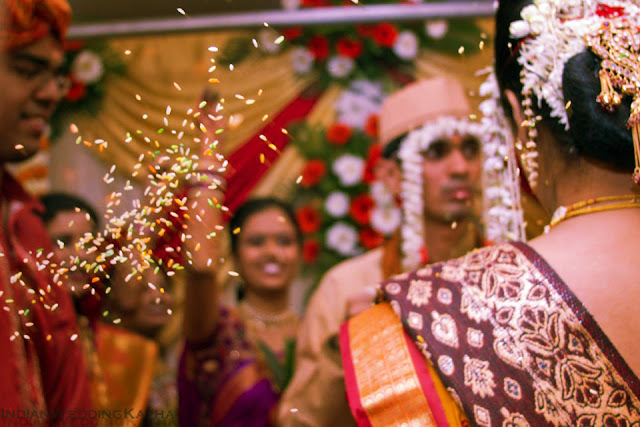 Dry, colored rice generally mixed with turmeric powder, is showered over the bride and the groom as blessings. Symbolically, Akshata represents prosperity, fertility and bounty. Uncooked rice, mostly raw rice, is mixed with turmeric to make akshata. Few also mix a little ghee in it. Mixing ghee will make the turmeric non-sticky on the outfit. In few places, they mix kumkum, saffron powder and water to the rice granules to make this. During weddings, the guests attending the wedding bless the couple by showering akshata on them. Devotees are usually blessed with this, shower over their head during pujas. When one seeks blessing from elders, they shower this on their head and pass their blessings through this. Akshata is offered while doing homa, with a popular belief that it these rice has meaning behind the life of the couple. This is considered as a sacred substance, which is believed to transfer the positive vibrations from the person blessing to the one being blessed. There is a practice of cleaning the floor with a cloth to collect the akshata’s used for blessing and to empty them in a well or at a place where no one would step on it. This article is brought to you by Mukta Event Managers, the best wedding planners in Hyderabad. We specialize in birthdays, candid photography. We are the best event management company in Hyderabad with utmost quality and care to the customer. Often called as the best event management company in Hyderabad, we will make your marriage a memorable affair.